Sofia Carson (DESCENDANTS) and Sabrina Carpenter (GIRL MEETS WORLD) star in a hilarious, action-packed tale of two sitters inspired by the '80s classic! Sparks fly when free-spirited Lola and prim, proper Jenny learn they're up for the same internship. But that night, after newbie babysitter Lola breaks Rule #1: NEVER take your eyes off the kids, she's forced to call Jenny -- currently on her own gig -- to help track down Trey, who has snuck out. Now with all their young charges in tow, these rivals must team up and brave the big city on the wildest, wackiest adventure of their lives! I watched the original movie back when I was a kid and it was cheesy one but when I heard that there would be a new movie I just had to check it out . I started watching it and had no real expectations at all but I did enjoy it. The acting was good and the storyline was good as well.The movie did keep me entertained and I know children will enjoy it. All in all Adventures in Babysitting is a good movie for the entire family to watch and I actually enjoyed this one better than the original movie. 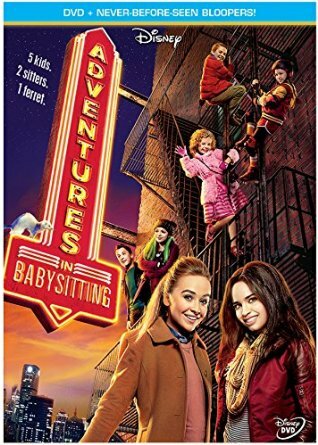 You can now purchase Adventures in Babysitting online or in stores near you.